The distinctive and striking architectural design of the Sydney Opera House in Australia remains remarkably fresh and vibrant decades after it was built in 1973. 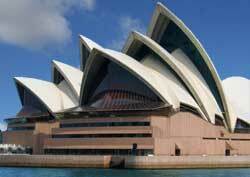 It was conceived by a relatively unknown Danish architect named Jorn Utzon. He won a design competition against 200 contenders from over two dozen countries. His gracefully curvaceous roof shells are often described as billowing spinnaker sails in a strong ocean breeze. Initially, many locals disliked his design, using derogatory words like "horrendous". Today, it is a pride of the city and Australia. Before the interior was done, Utzon was kicked off the project. Cultural politics played a part. The design was taken over by a committee. You know the usual outcome: foot-dragging and uninspired results. The interior of the Sydney Opera House is being refurbished. This time, Utzon is taking a major role.